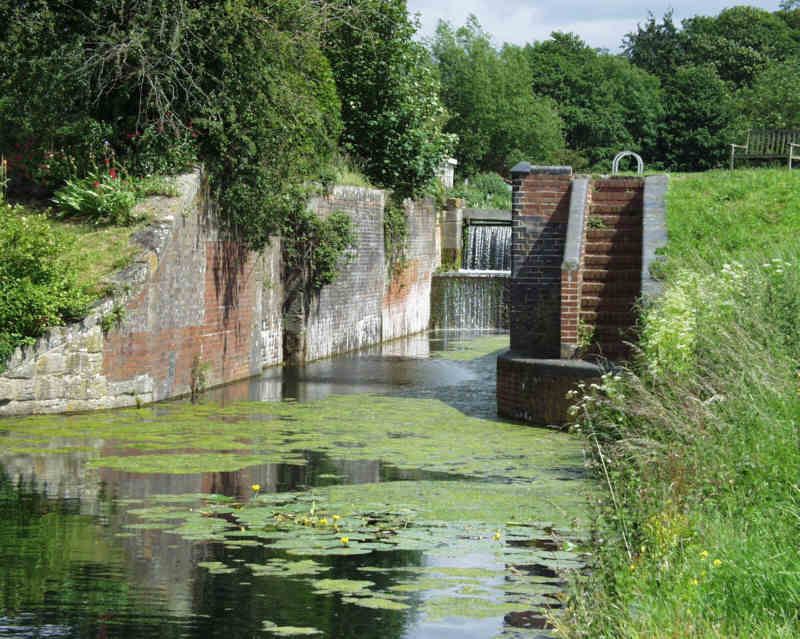 These two pounds of the Eastington flight of locks are accessible to portable craft and this description commences at the bottom (west) end near the Meadow Mill Overflow Weir. Oldbury Brook, the stream just beyond the end of this part of the canal used to flow into the canal and discharge through the Meadow Mill weir complex. The weir, which has been restored by the Trust, has two outer brick culverts under the towpath which lead to the main weir. The weir crest was long enough to cope with normal flows. 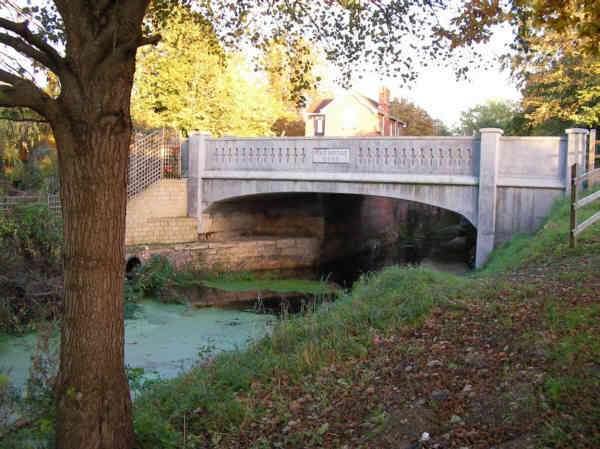 The centre arch leads to a large paddle which can be raised to increase the outfall of the canal. At the very bottom there is a trap door leading to a small culvert running right under the structure which could be used drain the pound completely. 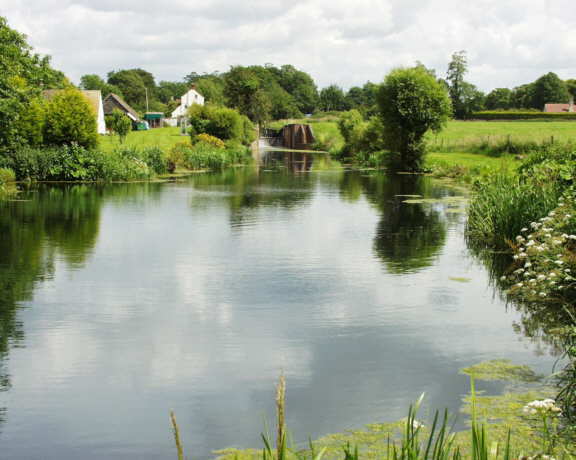 Coal was landed on a small wharf by the weir to supply Meadow Mill; this can be seen to the south of the canal. The wide pound by the overflow weir used to extend up the current course of the stream on the opposite side where there was a wharf serving the Wheatenhurst Union Workhouse (now William Morris House). On the point of land between the two, there used to be a boat house. The temporary dam between the end of the pound and the stream was built by the canal trust to allow the re-watering of this section. Dock Lock is soon reached. This lock had been infilled when Pike Bridge was destroyed at the end of the 1960s. In fact very large chunks of concrete from the bridge were found in the chamber. The brickwork of lock itself has been the subject of considerable repair by the Trust, some by volunteers and the rest by Stroud Job Creation. The towpath bank is quite high here so extracting a boat may prove difficult. The offside is private and part of a private garden. Stop planks have been inserted at the head of the lock and this allows a return to water having portaged around the lock but reed growth is a problem in the current reduced water level. Some modern techniques of bank protection have been tried in this section. The plastic piling immediately above the lock has not proved successful as it has tended to distort. A little further above the lock can be seen the entrance to a (now infilled) dry dock which ran parallel to the canal at this point. It was this that gave Dock Lock its name. For many years, the remains of a rotting boat (thought to be an ice breaker) could be seen here. Now only its rudder can be seen on the bank. 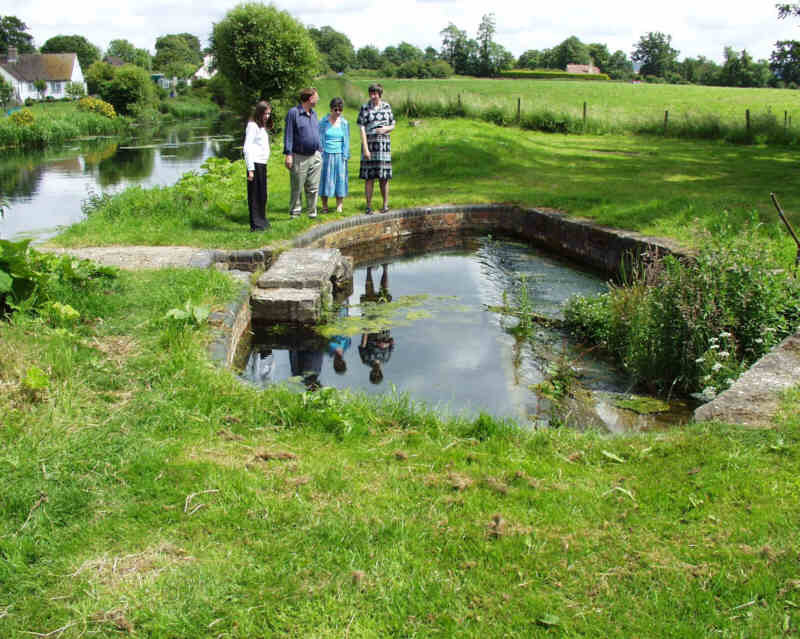 This whole are used to be the Stroudwater Canal's maintenance base. Beyond the site of the dry dock can be seen a brick building where items such as lock gates would have been built. At one time, there was a building with a clock tower but this disappeared many years ago. 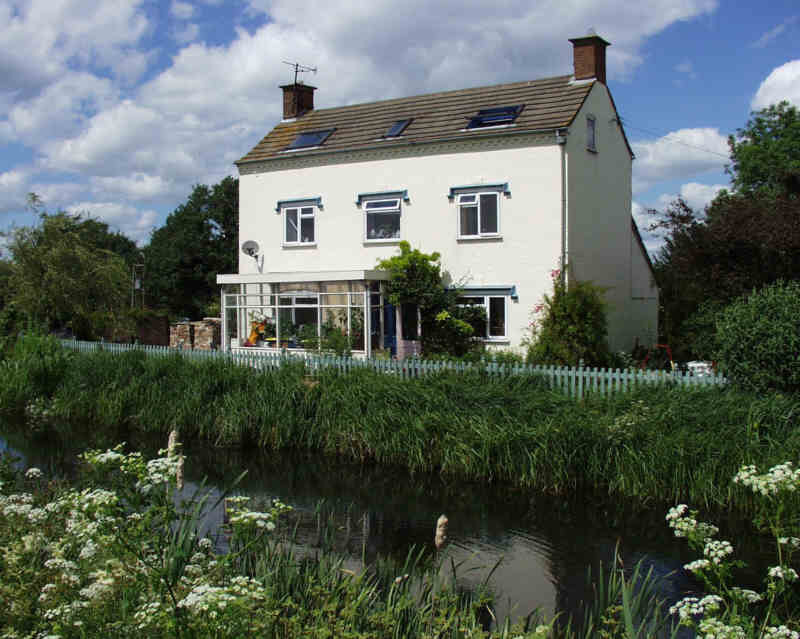 The white house looking over the canal was where the Canal Engineer once lived and is very characteristic of the lock keepers cottages elsewhere on the canal dating from the time the canal was built in the late 1770s. In between Dock House and the site of Pike Bridge was Eastington Wharf. The wharf cottage has now been much extended. The principle cargo handled by the wharf was coal and the wharf remained a coal yard well after the canal traffic ceased. The original brick arch bridge at the tail of Pike Lock was widened in the 1920s by a rather ornate and elegant concrete structure. 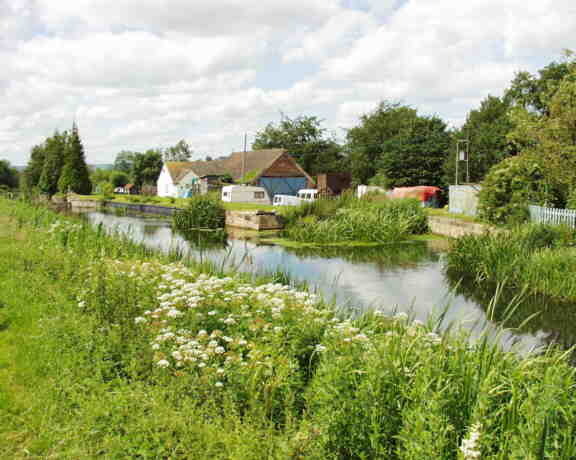 The road widening destroyed a pair of cottages on the south side of the canal and their gardens were turned into a road maintenance yard which has now become the Cotswold Canals Trust compound. The bridge was destroyed in about 1969 in a time of major road building which included the M5 and its loss, together with Bristol Road and Westfield Locks, aroused public concern which later manifested itself in the formation of the Cotswold canals Trust. 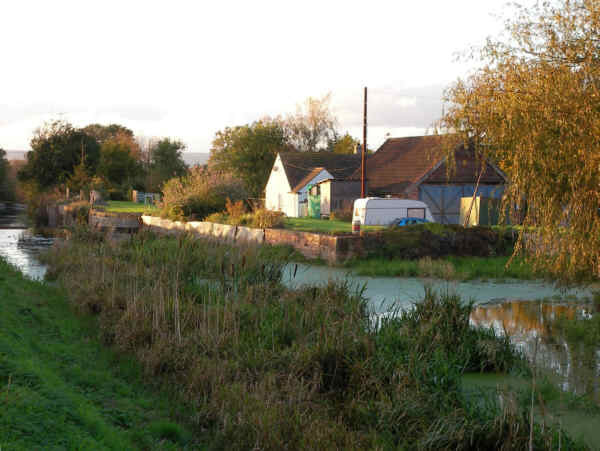 In late 2004 The Cotswold Canals Trust adopted the rebuilding of Pike Bridge as a major project and the new bridge was completed in July 2005. Information about this project can be found here. It is necessary to portage craft over the road to the head of Pike Lock.